A new generation of innovative protection! Why Choose Interforce Security Protection? If you’re reading this, you’re likely a Project Manager, Superintendent, Estimator, or in a similar senior role who is employed by a construction company looking for fire watch and construction security guard services for your ambitious project. 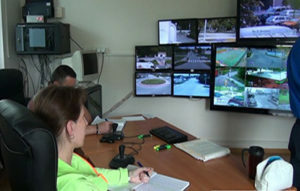 Fire watch security services is something that is taken VERY seriously by your insurance company that is insuring the project that is currently under construction. Although theft of raw materials is a big problem in construction sites, it’s not what your insurance company is mainly concerned about, it’s the threat of fire. Fire is the top concern for insurance companies who is insuring your project during the construction phase. And its not uncommon for your insurance provider to insist on having a fire patrol security guard on duty to prevent and neutralize any threat of fire. Just like in the horrific video you just watched seconds ago, your million dollar project cam burn and collapse like a deck of cards in a matter of seconds. Illegal dumping of items and large furniture after hours. Missing raw materials, such as copper wire, bricks, lumber, and other raw materials. 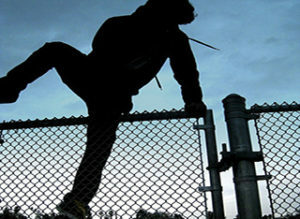 Kids and teenagers trespassing on property after hours. Trespassers entering the site and climbing up the crane. No traffic controller causing bottlenecks in traffic flowing in and out. Work sabotage due to union politics. Falsified contractor invoices for work never done, or inflated work hours claimed. With more and more insurance companies accepting professionally monitored job site surveillance cameras as a valid form of security protection for your construction site, you can slash your security and fire watch requirements anywhere from 35-70%! 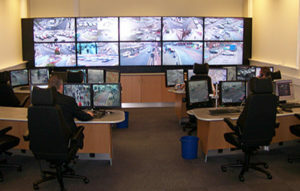 Interforce Security Protection offers a state-of-the-art control centre which employs around the clock video analytic operators who will monitor your construction site for fire, theft, vandalism, sabotage, and other suspicious activity, through advanced security cameras for construction sites. "Did you know your construction company can be held liable if a trespasser is injured while on site?" It’s already bad enough that someone decided to trespass onto restricted property. Even after fencing the entire perimeter and putting multiple “Do not enter” signs all around the fencing, trespassers will always find ways to breach the fencing in order to be up to no good. What’s worse, if that person (or persons) slips and falls, that’s a personal injury claim against your company regardless. Injuries such as a fall from trespassers climbing up the crane for a thrill to someone’s leg getting crushed due to them starting up a bobcat equate to legal liability for the construction company. This in return raises your insurance premiums because of someone else’s stupidity. "In your eyes, this is just a crane. 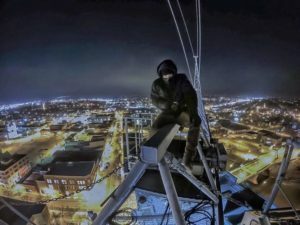 In a teenager's eyes, its a thrill seeking experience"
External threats involve trespassers entering restricted land in order to steal raw materials, sabotage and vandalize the property, dump large items such as unwanted furniture, or just wanting a simple thrill by climbing up the crane to catch a great view of the city's skyline. External threats like these are very worrisome due to the tremendous liability involved should they hurt themselves while on site. Any injury will result in your construction site being legally held liable. Sometimes, intruders come with accomplices in order to steal as much raw materials with a get-away vehicle waiting outside. 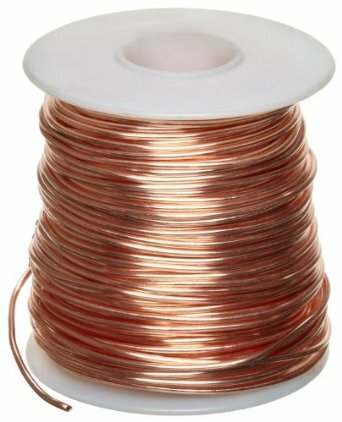 Copper wiring and pipes are viewed as gold to thieves due to its high value. Our vast experience in construction security concludes that internal theft is a larger problem than external theft. Appliances suddenly go missing without any explanation. Boxes of nails, faucets, tiles, grout, plywood, lumber are hot items to be stolen and add up to hundreds and thousands of dollars in stolen materials and supplies. 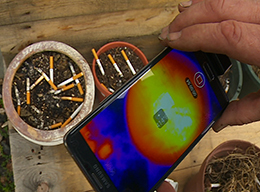 Copper wiring and pipes are a hot ticket item for thieves. And because contractors often have boxes of materials in their vehicles for transport, it makes it extremely difficult to track what is legitimate, and what is stolen. The dollar figure estimated as a result of internal theft is in the hundreds of thousands, and that is reality. Discarded cigarette butts, overheating electrical wires, and improperly positioned propane heater burners are the biggest fire hazards at a construction site. Despite clear smoking protocols not to smoke within 10 feet of the construction site, workers still always discretely smoke and drop smouldering cigarette butts on the ground. This can slowly but surely cause a fire if it comes in contact with combustibles, such as wooden interior framing. The second most noted fire hazard is the improper positioning of propane burners during the winter. 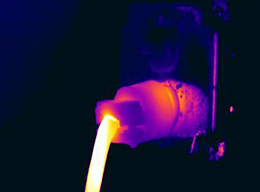 From time to time, these burner heaters are positioned directly at a combustible source, creating a major fire hazard. 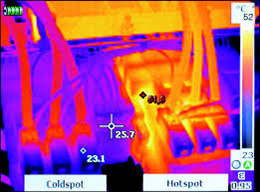 Sometimes, forklift drivers are careless and drop raw materials too close to the burner heater. In one instance, one of our fire watch security guards who was assigned to protect a four story condo completely made out of wood saw several propane burner heaters placed within inches from the wooden support beams! The third biggest fire hazard is electrical fires. This fire hazard is very tricky because it is generally not viable to the naked eye. Overheating wires or short circuits due to improper or damaged wiring can spark an electrical fire which can be catastrophic. 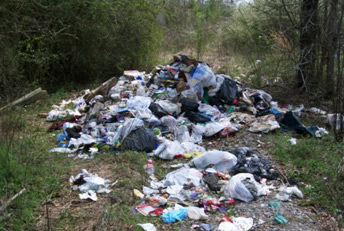 Interforce International Security knows that illegal dumping is a major problem for construction sites. It is not uncommon for vehicles to pull alongside the construction site’s perimeter and dump large objects such as unwanted furniture and mattresses. This costs the construction company unnecessary dumping fees. Interforce International Security will work work with the on-site superintendent to place garbage bins away from the perimeter and more inside the site, close to the building. This discourages illegal dumping because the trespassers will have to enter the compound in order to discard their unwanted belongings. Security signs will also warn people not to trespass or else face prosecution. Illegal dumping such as above can cost the land developer thousands of dollars in unnecessary dumping fees. Copper wiring, lumber, bricks, boxes of nails, faucets, tiles….. the list is endless. Even contractor tools are a big target inside a construction site. Interforce International Security will work with the superintendent to encourage secure storage of all raw materials inside metal storage containers. We also understand that not all materials can be secured inside metal containers, and we often see skids of raw materials placed out in the open. Interforce International Security will assist the superintendent in “grouping” easy to carry materials in one area, making it easier for security guards to protect the contents from theft. By grouping materials by weight, the more heavier materials that need industrial machinery are less likely a target for thieves, allowing a specific area to be concentrated on for light weight materials. 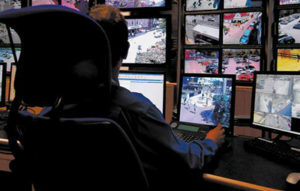 Interforce International Security can also provide secure access control to secure the compound. With frequent foot patrols, we will create a strong visual security presence for all employees and trespassers to take notice. We have experienced teenagers playing hide-and-go-seek. Young couples wanting to make out at the top of the crane, kids spraying fire extinguishers at each other just for the thrill. Although they do not pose any harm in the integrity of the construction site, the liability of them getting injured with no head and/or foot protection is placed on the construction company. Regardless whether trespassers were negligent to ignore the “keep out” signage, this is an injury claim that can be made against the construction company. With Interforce International Security on guard, we will ensure that unexpected visits from trespassers are dealt with immediately. 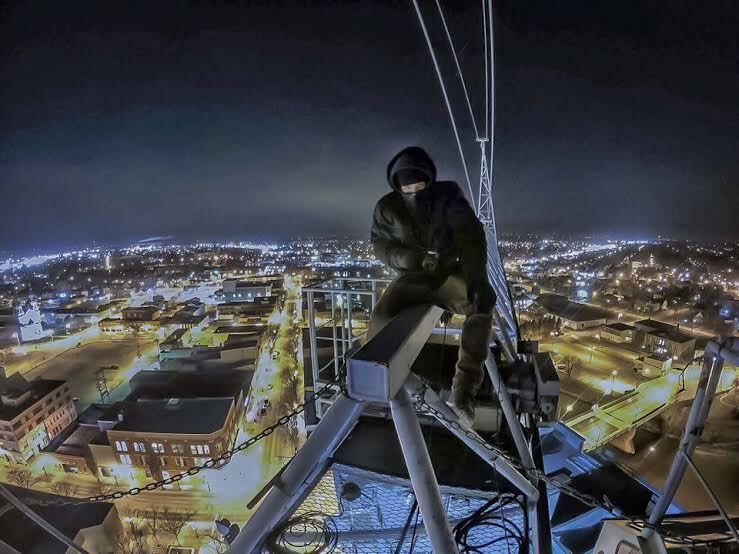 Interforce International Security has experienced numerous instances where trespassers wish to climb up the crane in order to see the city’s beautiful skyline. Sometimes these are just individuals seeking a thrill, and other times couples go up the crane to make out. Although they do not mean any harm, the liability is far too great should they fall and hurt themselves. With no head and foot protection, and no fall arrest training, they are a serious legal threat. Regardless of them ignoring all the “no trespassing” signs, them getting injured on site is a valid injury claim against your construction company. Interforce International Security’s strong security presence will prevent anyone from breaching the compound’s perimeter. Teenagers love to snap photos at the top of the crane. This poses TREMENDOUS liability for the land developer should they fall and hurt/kill themselves. Regardless whether or not signs are placed around the perimeter not to enter, the land developer will be held accountable if an injury or death occurs. With the influx of inbound and outbound construction vehicles, it is not uncommon for bottlenecks to occur. Our security guards can provide traffic control in order to maintain an orderly flow of inbound and outbound vehicular traffic. Also, our security guards can also detour and briefly block a lane in order for larger construction vehicles to reverse in the construction site in a safe manner. With the necessary reflective safety wear and signage, our security personnel can alleviate traffic congestion, making it easier for everyone to get where they need to go in a timely fashion. A trades company is replaced by another vendor in the middle of construction. Quite often, 30 days notice is required to terminate a contractor’s service (as outlined in the service agreement). When the notice is provided, the performance of all employees employed by the affected contractor starts to plummet, knowing that they will likely be unemployed after 30 days. Work is performed at a much slower rate, tempers flare, and work is poorly done on purpose to demonstrate their disapproval of their services no longer being needed. In some extreme cases, work is intentionally sabotaged and done incorrectly, which causes major concerns for the construction company. Their reputation as a quality builder is on the line and can negatively affect their image. Union politics: Union politics play a major role in work sabotage, especially when their collective agreement is nearing its expiry and due for renewal. It is not uncommon for unionized workers to intentionally work slower during contract negotiations. 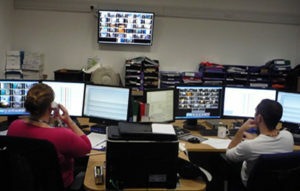 This creates a huge surge of unscheduled overtime in order to get a day’s work done. Labour costs skyrocket during this tough time of negotiations and is often done by unions for more bargaining power. Work can intentionally be sabotaged to frustrate the employer, again done as a tactic for more bargaining power. In fact, Interforce International Security just recently had to not just deal with an entire construction management firm being replaced by another one due to their poor performance. The manpower needed for security guard services was astronomical! Interforce International Security knows what to look for when it comes to work sabotage. All security guards are briefed discretely on what to look for, and how to report it to the appropriate management staff. Our presence will minimize work sabotage by the means of a strong security presence, greatly reducing the chance of disgruntled workers doing something that can harm the construction site. Unsupervised subcontractors can easily falsify billing hours, which causes inflated invoices for the construction company. If a subcontractor bills your construction company by the hour, falsified billing hours are a huge concern. No one wants to pay for 100 hours of work when only 40 was performed. By having Interforce International Security supervise the trades while performing work, we can accurately note down the hours worked and submit them to the appropriate management personnel. This ensures that your construction company only pays for the hours that work was performed, and can easily identify deficiencies when it comes to hourly billing of construction services from subcontractors. Contractor escorts are also commonly requested by construction firms when sensitive work is being done that involves the installation of high value materials, such as copper wiring. Our security guards can maintain a strong security presence in order to secure the valuables while they are being installed. 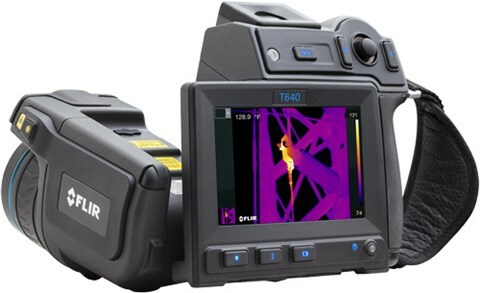 Interforce International Security can detect fire hazards when others don’t with the use of thermal imaging camera to detect temperature contrast. 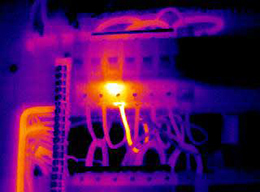 Live hot wires and smoldering cigarette butts are easily seen due to the extreme temperature contrast. Our fire watch and construction security guard services are top of the line protection services for your construction site. 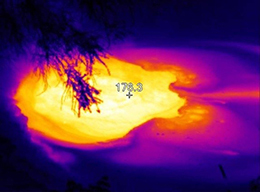 By using thermal imaging for fire watch, we are able to detect and avoid fires from electrical short circuits, smoldering cigarette butts, and other fire hazards not viable to the naked eye. Your project is worth millions of dollars, so a competent fire watch and security guard firm is crucial for the safety of your site. Contact us now to see why we stand in front of the rest when it comes to construction site protection! Copyright © 2017 Interforce International Security & Investigations Incorporated. All rights reserved.